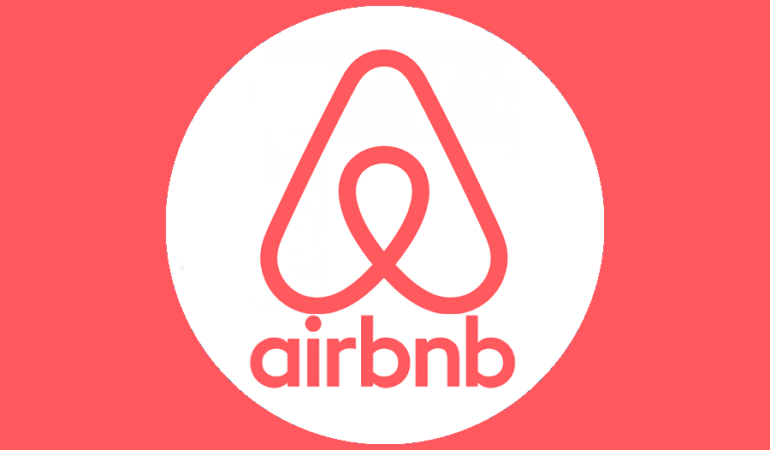 Airbnb.com matches those with available rooms in their homes or a vacant home with visitors traveling to the area. It’s free to register and list your property on the site and you get to decide your rental price. Once rented, Airbnb handles the payment and keeps 3% as their service fee. Once registered as a host on the site, you will need to create your listing in order to start earning money. With that, I present you with this step-by-step for creating a successful listing that will take you through the process of perfecting your first listing from its very inception. 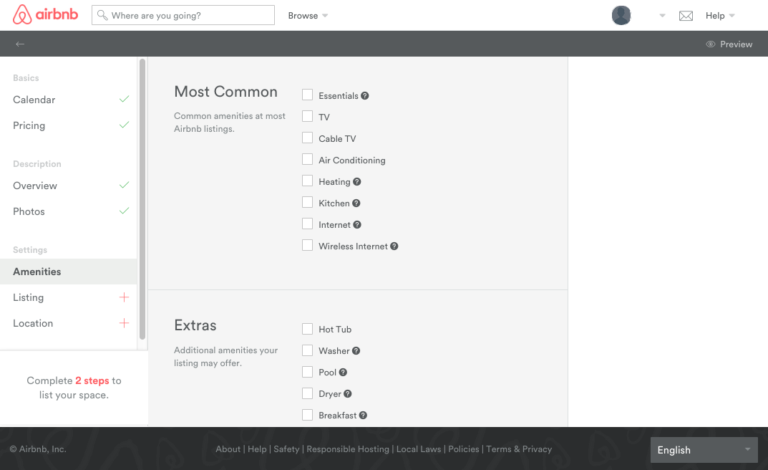 First things first: head to Airbnb.com and select the ‘list your space’ option in the top right corner of the homepage. You’ll be directed to a form prompting you to fill in the most general criteria of your place. Take note that you can only complete this first form prior to creating an account, so it may be more efficient to sign up (or log in) before you begin. If you have not yet signed up or logged in, you’ll be prompted to input your information at this point. Home Type: These options are pretty straightforward. To avoid any confusion, Airbnb added a brief description of each home type that appears when your mouse hovers over. Select the option that best describes the property you are managing. Keep in mind that the drop-down menu to the right expands your list of choices pretty significantly, including everything from loft to castles, tents, and so forth. Room Type: This distinction is one of the most important, as both you and your guests may be particular about maintaining a certain level of privacy. So, make sure that you’re accurately building your listing as to attract the most apt guests for your property. Like with the home type, Airbnb provides short definitions of their room terminology to help guide you through selecting the option that best describes your accommodation. Before choosing “Entire home/apartment,” consider the fact that granting guests exclusive access to your place might include access to other amenities on the property, such as a pool house or a garage. Similarly, the “Private room” option includes more home sharing than you might typically expect, such as that of any connecting rooms, bathrooms, or kitchens. In addition, you will not be able to edit the number of beds offered in this listing unless you select ‘Entire home/apt’; the other options will automatically register your property with 1 bed. Accommodates: This menu allows you to select the maximum number of people that can comfortably fit in your listing. For now, calculate how many people you can accommodate if each has his or her own bed, sofa bed, or inflatable mattress, provided that the sleeping arrangement is as comfortable as you would expect if you were the guest yourself. Finally, select the appropriate number from the drop-down list given. City: Once you begin typing the name of the city where your place resides, Airbnb will automatically suggest all relevant matches. Choose one, press ‘Continue’, and move on to the next step. Now you’ve arrived at the hub of your listing’s more specific details. 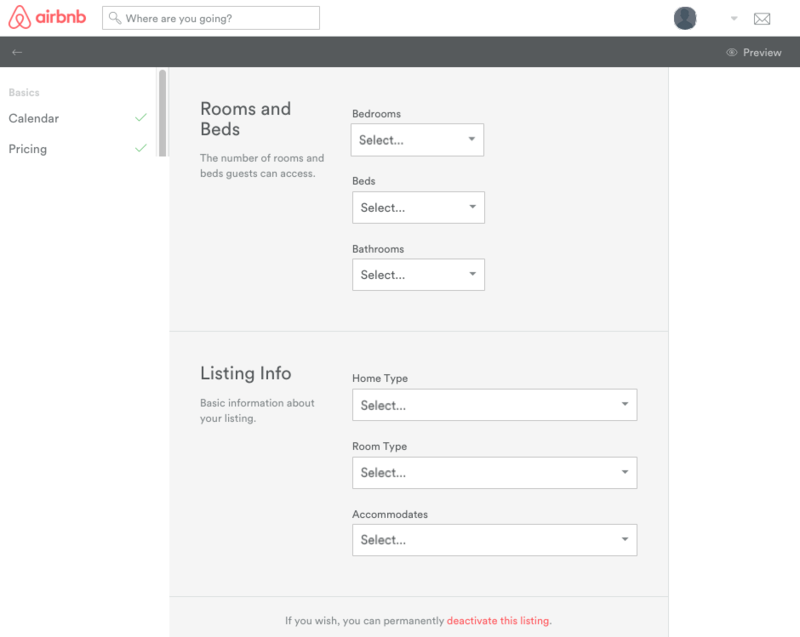 Airbnb has split this next step into sections, so it will be easiest to cover all information if you take it from the top and fill out the sections in the order that they appear on the list. If an inaccurate listing secures a booking, you will not be able to change the faulty criteria of that listing without first sending an alteration request to the guest in question. This could cost you a booking and waste your time. So, be diligent with your listing details, because a small error can have a big impact. Keep in mind that at any point you can go back to edit the previous descriptions provided. Or, Make use of the ‘Preview’ button in the top corner of your screen to see how your potential guests will view your published content. Airbnb provides three options for specifying the availability of this particular listing. 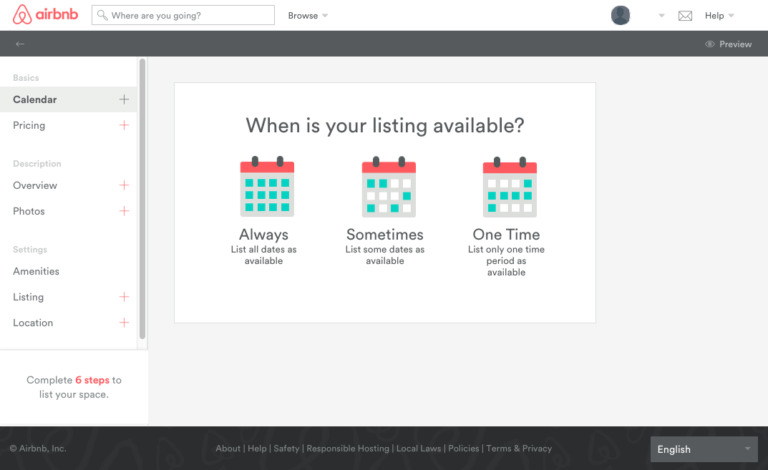 Currently, these options reflect how long you want your property to stay listed on the Airbnb market, rather than specifying actual dates for rental. . You can choose for it to remain listed indefinitely (‘Always’), only for specific dates or a fixed periods of time (‘Sometimes’), or limited to a single fixed period of time (‘One Time’). The specific dates available for rental should be inputted as soon as you publish your listing and should be updated regularly. Airbnb will suggest a price for you to charge based on the information that you’ve provided thus far as well as on trends currently shaping the local rental market, such as holidays, increased tourism, and more. 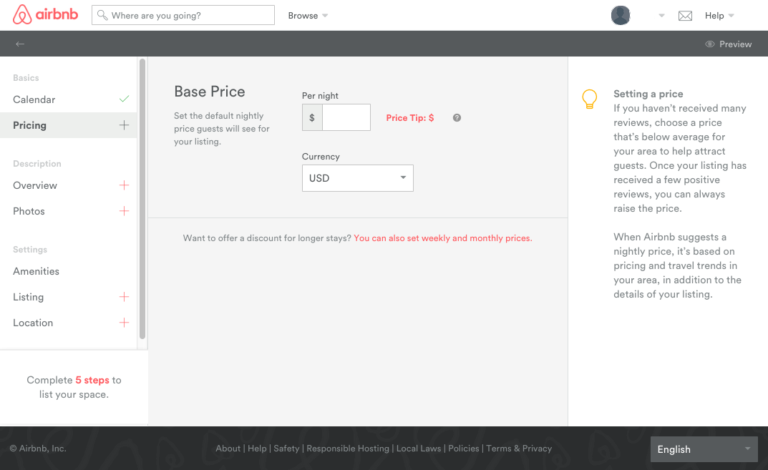 You have the option to play around with the pricing generator yourself, but for first-timers who are new to the site like you, Airbnb recommends starting below the suggested rate, which can help you get a foot in the door before you’ve had a chance to build up your profile reviews and other credentials. However, it’s important to remain relevant and competitive, so take this step further by comparing prices of similar Airbnb listings in your area on your own. On top of general listing qualities and market activity, there are a few other factors you should consider when calculating a price. For one, you may want to exercise your option to tailor your listing’s going rates by creating weekly or monthly packages to encourage longer rentals. You should also factor in the cost of utilities, taxes, or cleaning ahead of time – Airbnb even gives you the option to add an additional cleaning fee to the price. It’s important to note that while you cannot include these in a base rate, penalties for late check-ins or other situational variables that you plan on charging guests should be communicated before a booking is secured. Title: Think of the title as your first impression. You want to make those 35 characters engaging enough to capture attention and unique enough to accurately depict your place. Try using descriptive and pleasant adjectives to cushion your title. 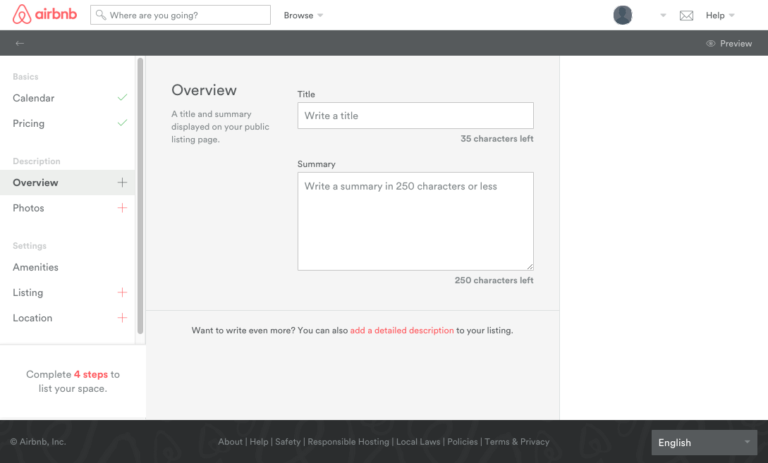 Summary: A great summary covers the major features of your listing in 250 characters or less. People like a bit of personality, so let yours shine through while explaining exactly what it is that makes your place unique. Bullet points and short sentences can go a long way: too much writing looks daunting, so try to break it up. 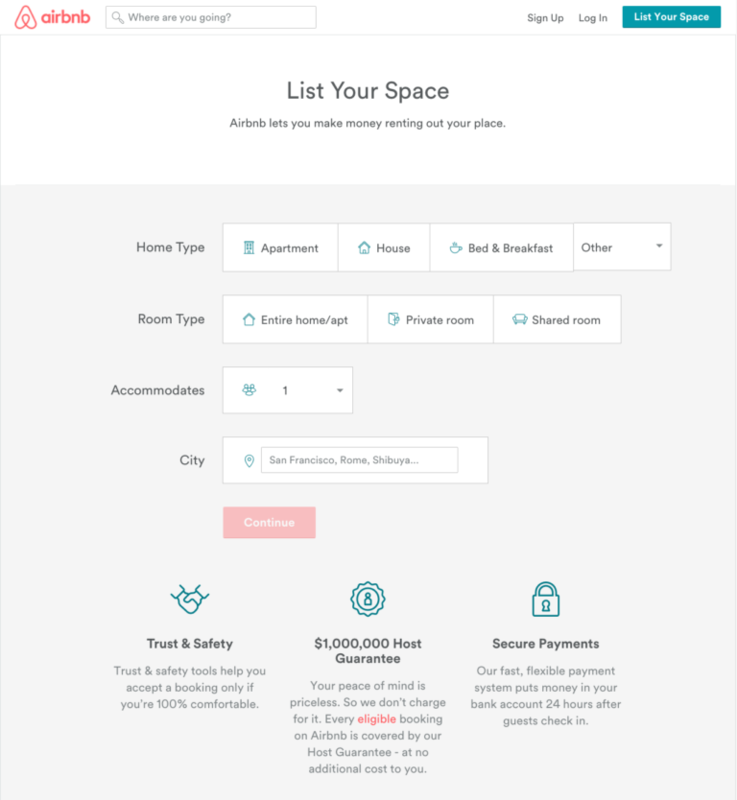 How To List on Airbnb – How To Set Your Airbnb Listing? While you have the ability to add many photos, it’s best to add only around 10 as to not overwhelm the potential guests. Regardless of how many you decide to upload, the first 3 are the most important as they frame the window into your listing before users make the decision to click into the post or not. This is all the more reason to offer standout and high-quality pictures. Try to take this opportunity to show off amenities, quirky rooms, or other features unique to your property. 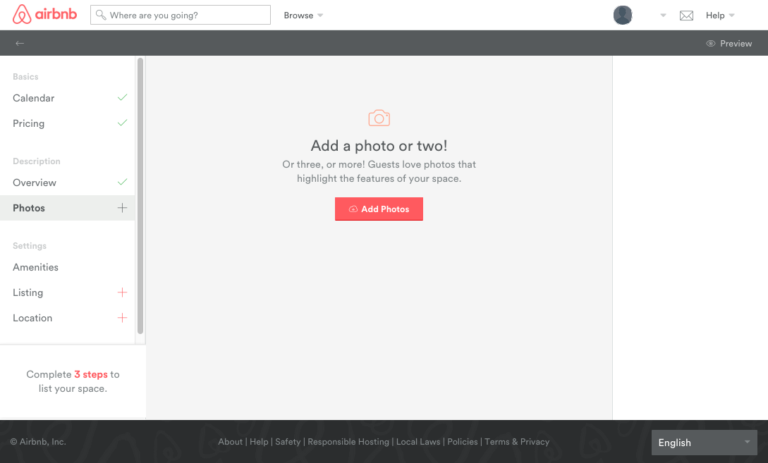 Airbnb recommends using bigger photos for better resolution (1024 x 683px) and even offers free professional photography sessions to help you best capture your place. Selecting The Right Amenities For Your Airbnb. This section has a lengthy list of features that ranges from common or extra rooms, to home safety measures. At this stage of the listing, you are only given the option to select from the available list of amenities,, but once the listing is created you will be able to edit this section and add additional or further descriptions and details. Make sure to include every appropriate feature as some guests can be swayed by certain extras, or uninterested due to a lack thereof. Filling Out Airbnb Listing Information. Most of these listing details should already be filled in for you if the first steps are done properly. You can edit every item unless you’re listing only a single room (either private or shared), in which case the number of bedrooms will be pre-registered as and unchangeable as 1. Simply input the location of your listing and voilà, you’ve completed the Airbnb listing process. Once you begin typing your address, Airbnb will suggest the remaining details to autofill for convenience and accuracy. 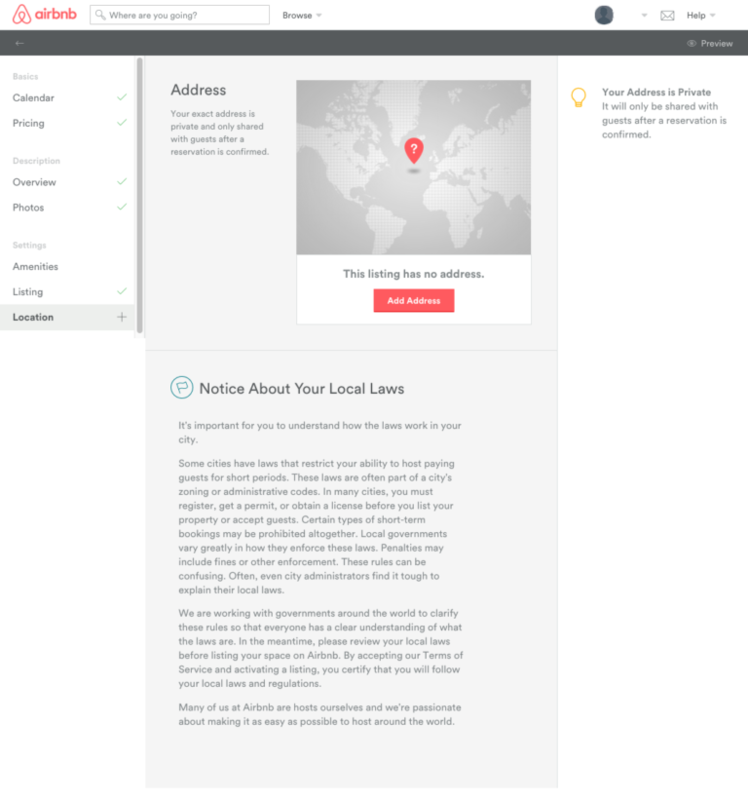 After your location is filled in, Airbnb will prompt you with a box to add directions and generate a section below with a notice of your local property laws for reference. As noted on the sidebar, the indicated location will not be viewable to the public, so you don’t have to be concerned with any private information circulating around the web. Instead, on your listing, a circle will appear on a map at the bottom of your listing to give an idea of your area and neighborhood. When you’ve completed all the steps and are happy with your listing, you’re ready to be published on Airbnb.com. One thing to keep in mind is to always be honest in your description: it won’t take long for the truth to come out once your guests arrive. However, it will be helpful for you to try and spin the not-so-good features of your place in a positive light whenever possible.